I am fascinated with the YouTube promotion of the dunk contest, as previously covered here and here. But I wanted to pull in a little more context. Rudy Gay’s initial video has been viewed over 1,600,000 times in the past two weeks generating over 2,200 comments and nearly 200 video responses posting dunks that he should try out. Now that’s viral marketing the way it should be done in the interactive space. The NBA, Sprite, and YouTube combined to deliver a campaign that captivated an audience and built a platform for interaction that has tremendous opportunity for payoff during NBA All Star weekend. But I stumbled on the icing on the cake today thanks to the community over at Yardbarker in Jamario Moon’s teaser video for a dunk that will knock your socks off. Moon, an ex-Harlem Globetrotter who has a growing following of NBA faithfuls, shows off his stuff in a YouTube promo. Stick around until the end for the cliffhanger, it’s a little staged and cheesy, but totally worth it! 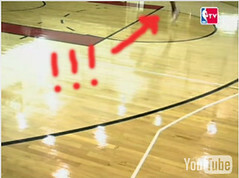 In case you missed it, here’s a screenshot of where Moon took off from for his two handed jam. That’s just sick! The only way he could top that would be to pull an “Over the Moon” and dunk over himself! I haven’t been this excited for a dunk contest in a long time. It’s about time the NBA made this hyphy again. Help Rudy Gay choose his dunk for the dunk contest. I must say, it’s a pretty slick way of pumping yourself up to be the fan favorite come dunk day. Think of this as the Internet generation’s “pump” ala Dee Brown. Rudy’s already leaps and bounds ahead of the competition as the favorite going into this years dunk competition. This cements him as the man to beat.